Onon and Leah with Jamie at our booth at CITES. Miss Scuba International Jamie Piyada Monmaneerat dropped us a note recently to let us know what she's been up to since the Convention on International Trade in Endangered Species of Wild Fauna and Flora (CITES) in Bangkok this past March. 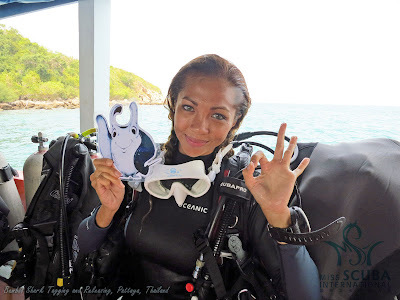 "Leah gave me Manta Reina and I promised to take her with me on my Ms. Scuba journey. Here are some photos of Manta Reina and me during some of my missions in saving our ocean. She is now my extra dive buddy, who I introduce to everyone I meet on the diving boat. 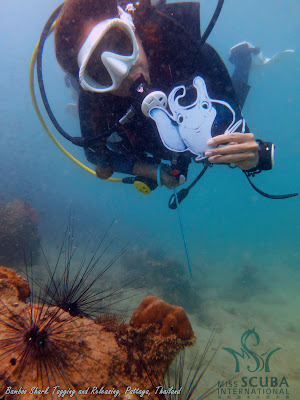 She is a permanent resident in my BCD pocket and she travels with me wherever and whenever I go diving." "I came across The Adventures of Shark Stanley and Friends story book during the Thailand Dive Expo and I completely fell in love with it! Education and raising awareness are the most important things and they are our last answers to survival, our hope to help us maintain what we have left right now. " "I travel to coastal communities in Thailand to educate the local children as the ocean is their front and backyard, so we need to educate them and raise the awareness and their love for their home." "Lastly, I would like to thank you and all members of Shark Defenders for all your hard work and efforts to protect our ocean and our ocean friends, I am truly inspired by you all."